The final final was a low point after some dizzying highs. The squad gathers after tonight's final defeat. IRELAND FELL TO disappointing 45 – 21 defeat to England in tonight’s World Rugby U20 Championship final. But to end the tournament on a low, Nigel Carolan’s men delivered some dizzying highs along the way. Here are some of the building blocks the coaches and players can take forward from the tournament. Before the tournament, head coach Carolan broke ranks somewhat and said he believed that young Irish players lagged behind their overseas counterparts “technically, tactically and more importantly physically.” Tonight’s viewing would lend credence to that view, but across the tournament as a whole Carolan’s players seemed to rise to the challenge rather than take offence with his view. Against Wales, there was a try for the ages with offloads flying to and from fingertips as Ireland stormed back from a losing position. Against New Zealand, the standard bearers of skill in the game floundered in the wet while Ireland made the pill stick. There were flashes from James Ryan in the Six Nations, but in this tournament almost every man displayed a bravery in possession — even to a fault, as the chase for a lost cause tonight saw offloads go to ground. It was particularly evident against the Baby Blacks, but when Ireland needed a score or a rock solid-footing in the red zone, they went to the line-out. In Adam McBurney and Ryan, the Wolfpups clearly had class acts putting the set-piece into action. But the tools provided by forwards coach Peter Malone created a maul that sliced through team after team… even the new World Champions in the second half tonight. Harry Mallinder touched on the issue post-match, having started the tournament in the back three, injury forced him to take the reins late in the tournament and he utterly terrorised Ireland. This age grade is the last big chance to settle players in a position before sending them to the big league and Carolan had his own moving to do. Perhaps the most impressive of the positional switches was Conor O’Brien. The Mullingar man played as an out-half at younger grades and was impressive as a wing during a tough Six Nations campaign, but in this tournament he was absolutely brilliant at inside centre. Jacob Stockdale can clearly play anywhere along the back-line, but his displays over the past few weeks have raised the possibility that 15 might just be his best position – though he might have to wait for Charles Piutau to packs his bags. Before the semi-final, we wrote that the Wolfpups needed a good start and needed to arrest the habit of fighting back from losing positions. But everyone falls behind sometimes, so to have the memory of big comebacks against the Grand Slam and (former) world champions installed in the brain will ensure these players have the confidence to continue playing the game the right way when they need to reel an opponent in. As we witnessed tonight, the temptation is to force the issue and attempt the improbable. But when Ireland were 17 – 0 down and staring down the barrel of their tournament being over before it finished, they steadied the ship rather than run it up on the rocks. Bill Johnston’s 24th minute drop-goal to reduce the deficit from 17 points to 14 against Wales didn’t look like much at the time, but it was the beginning of a tremendous tournament for Ireland. This is a team that can give hope not only to Ireland U20 and Nigel Carolan-coached teams, but to Irish Rugby as a whole. As the provinces (and latterly the national team) have demonstrated, this island needn’t approach tournaments or Tests as an underdog, a plucky scrapper happy to advance to the knockout stage. Whether facing the toughest task in the game, reeling in a massive deficit or building an unassailable lead, Carolan’s men calmly went about their business. They topped the toughest pool in the tournament and then ruthlessly dismantled an Argentina side in flying form. It unraveled in the final, yes. But it’s two years since Ireland recorded their previous PB at U20 level, crashing out at the semi-final stage. They’ve built from there and they will build from here. Email “5 huge positives Ireland U20s can carry forward from this tournament”. 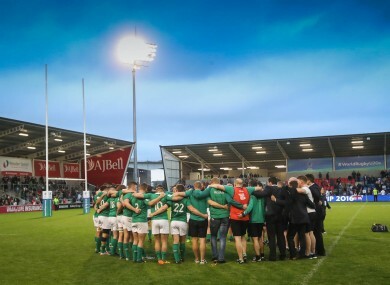 Feedback on “5 huge positives Ireland U20s can carry forward from this tournament”.